Can you add tickets? Is there a waiting list? Is there a discount for seniors or children/ can I bring my child on the tour? Is it accessible for strollers? Do you cater for vegetarians/ other dietary requirements? A: Yes – we have to give the restaurants notice of how many people to prepare food for. Tickets must be purchased a minimum of twenty four hours before the tour starts. Most tours sell out well in advance. A: A guided tour, information sheet and enough tastings to replace a meal for most people. Prices for the van-based tour include all transport during the tour. A: All ticket sales are non-refundable as the ticket represents a guaranteed space on the tour of your choice. If you need to reschedule your tour date please let us know as soon as possible – we may be able to reschedule you if space is available on another date. We are unable to reschedule within 7 days of the tour start time. A: Although it is very rare, we do reserve the right to cancel in cases where minimum enrollment is not met or due to dangerous weather conditions or other adverse circumstances beyond our control. In the case of cancellation, we will refund tickets or reschedule tickets to another date or tour. Otherwise, tours run rain or shine. Q: Is there a waitlist? A: For most tours tickets must be purchased a minimum of twenty four hours before the tour starts as we have to give the restaurants notice of how many people to prepare food for. Q: Can I bring my child on the tour? Is it accessible for strollers? A: We cannot accommodate young children on the van based tours since the van is not equipped to accept children’s car seats but we have had customers who choose to drive themselves and follow the van. The walking tours are approximately three to four hours long. Parents, who know their children best, should assess the situation individually as to whether the tour is appropriate for their child. Please email us if you have questions. Strollers are generally not practical given space restraints in the smaller shops and restaurants. Q: Do we just drive/walk around and eat? A: Absolutely not! The food tour combines information about the city and the neighborhood with behind the scenes culinary insights, creating a unique, fun and informative experience. Your guide will provide information about history, culture, architecture, entertainment offerings, and both well-known and newer establishments. A: Yes, we find that even people who have lived in Columbus all their lives learn about new places on our tours. We also try to give you behind-the-scenes or unique experiences that you would not have if you weren’t on a Columbus Food Adventure. A: Bathroom stops may be somewhat limited on taco truck tours, but otherwise the restaurants will all provide ample facilities. A: Yes – except on the Short North and Grandview tours where we like to give guests a chance to explore the neighborhood at the end of the tour. Q: Do you cater to vegetarians/ other dietary requirements? A: Some itineraries are more vegetarian-friendly than others. Please see the tour pages for further information, and feel free to email or call us about specific dietary requirements. We do our best to accommodate dietary restrictions where possible but we are not able to accommodate all dietary restrictions at every stop. A: Absolutely! If you get a shot you love, please share it with us on Facebook or Twitter, or include it in a review! A: Absolutely. We offer private tours for groups of 8+ people. 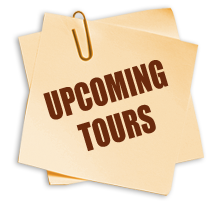 Please see our private tour page for more information. 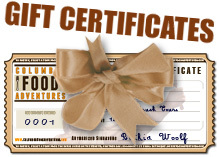 You can also call 614.440.3177 or email us at bethia @ columbusfoodadventures.com to arrange a private tour. Q: How much food is served on the tour? A: In general, most find it enough to replace one meal. Q: How many stops are there on the tour? A: This varies, though generally it’s around 5-7 stops. The description of the tour you’re interested in will show this information. A: Each walking tour’s description will include the approximate total walking distance. A: It varies, but the maximum number is 14-15. A: Gratuities are by no means expected, but always appreciated. We also gratefully accept your feedback on Yelp! or Trip Advisor. A: Beverages are not included unless they are a specific part of the tour. If you order anything additional at a restaurant it would not be included.